our video was a test run with new equipment so it's a little "bland' but you get the fun of driving the view by rotating the screen. 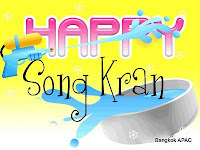 The festival of Songkran is an old tradition in Thailand. It marks the New Year according to the Thai lunar calendar. The tradition is an example of beautiful Thai culture revealing the joy, generosity, warmth, and respect of the Thai people. a water-throwing funfest, in which anyone and everyone is liable to get thoroughly drenched. There is some interesting points to note: Travel costs may be higher (supply and demand), less locals (many return to their family homes to celebrate new year) so enjoy smaller queues. Most everyone is committed to a three (3) day celebration - "throwing water" AND BE WARNED - if you don't like it stay indoors - getting angry is BAD culture. PLAN AHEAD: get your tours and shopping sorted and allocate the three water days to "len naam" (play water) or rest in your hotel. The actual festival dates in Thailand vary a little..